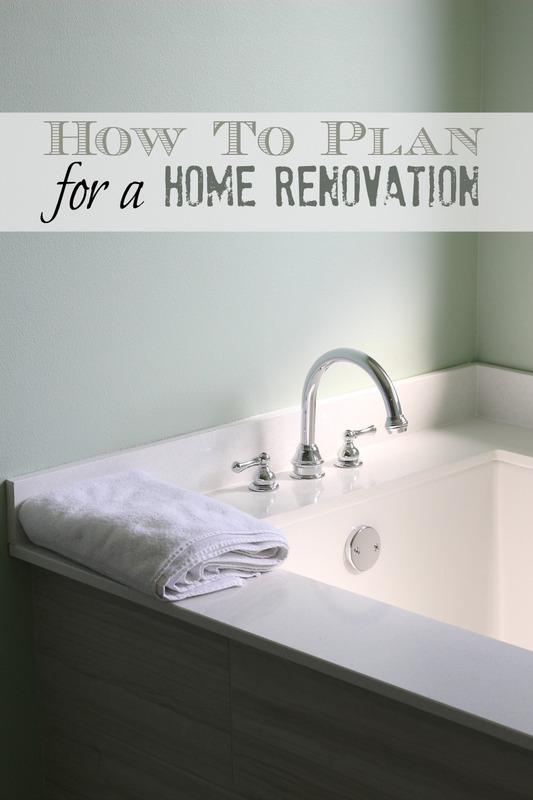 Last fall, we completely gutted our master bath. We literally took the room down to the studs and started over fresh with a completely new bathroom! Our house was built in 1979 and it was the only room that had yet to have any serious renovations done. The previous owners had done some cosmetic updates, like new fixtures and fresh paint, but at the end of the day, it was still a 1979 bathroom that needed a sledgehammer in the worst way. So we decided to bite the bullet by hiring a contractor, getting a few bids, and the next thing we knew a few guys came in with those sledgehammers! I learned a few lessons (some of them the hard way) and learned that the PLANNING of your home improvements is just as important as the implementation of those improvements. What were some of those lessons? The biggest one (or two, really) was expect it to take longer and cost more than what your bid states. Contractors know what they're doing, but they can't see and know everything about your home until they're already working on it. Expect for unplanned expenses and delays in work - just build them into your budget and timeline in advance! For our timeline, we were quoted two months. We live in Dallas, which currently has one of the hottest housing markets in the country because of the stellar job economy here. Not only that, but our neighborhood in particular is in the national top 10 for explosive growth. We bought right at the beginning of the growth curve, so we're loving what we're seeing for home sales! That means our home equity is increasing. We increased it further by renovating the last room in the house that needed improvements! The bummer about all the growth meant that contractors are BUSY. Our timeline got blown out of the water quickly. I had ordered custom vanities that should have taken six weeks to build and arrive; but because of all the growth and how busy the builder was, they took almost nine weeks. That threw my contractor off so that he had to rearrange his staff on what projects they were working on. It ended up that the vanities were delivered and sat in for a week because my contractor didn't have capacity to install them. That threw us off by 10 whole weeks! I learned there's an order of operations in construction. Tile has to be laid before vanities can be installed; the vanities have to be installed before the counter tops can be installed; the counter tops have to be there before the under-mount sink can go in; and so on. So when one piece of the puzzle gets thrown off, the whole project is delayed! Budget was the other big lesson. As in, you need far more of it than you think! I know HGTV tells us we can do a whole master bath for $8,000 but let me tell you: Nope. You can't. That wouldn't have even paid for the labor, let alone materials cost for our bathroom! In fact, I can tell you that my vision for the bathroom was to have a large, free standing soaker tub instead of a drop in. When we were out selecting materials for our renovation, I fell in love with a cast iron soaker. "Ohhhh, babe, that's our tub!" I said. Then I asked our sales associate "how much" and with a grimace, she replied, "That's a really nice tub... It's $10,000, and that doesn't cover delivery." So, that was out real quick! We paid our renovation in cash, but that's not the reality for most folks. Capital One has this really neat home equity calculator, and also has great rates for home equity loans, which is how most people finance their home improvements. Whether you’re remodeling your home or consolidating debt, Capital One is there to help with simply smarter tools that help you choose the right option for your situation. Now that the master bath is complete, the our next task will be replacing the carpet in the bedrooms. The living, dining and hallways are all hardwood or brick, but there's carpet in the bedrooms that the previous owners installed a few years ago. They put in high quality carpet, but it's beige. And I have two boys. And a dog. And a husband who seems to spill coffee every day. We invested in a Rug Doctor and do spot cleaning every few months, but someday we'll just outright replace the carpet. I'm not sure if we'll do hardwoods or if we'll do different carpet, but I know that I can expect it to take longer than planned and cost more than we though! And if we need financing for our next home improvement, I know I can use the tools from Capital One and get a great rate on a home equity loan. Planning and budgeting is hugely important before undergoing any major (or minor) home renovation - it's always more than you think, isn't it? I could live in your bathroom and loved how it turned out. this is super helpful! we haven't done anything crazy to our house, the biggest thing was the floors, and that absolutely took longer than we thought and cost more than we expected haha. we will hopefully do bigger things to our next house, like bathrooms and kitchens. scary! Oh girl I know about the timeline issue. Our remodel should have been done months ago. Luckily our contractor stuck to his original quote, even though it took longer and cost more than expected. Your bathroom looks great! We bought a house last year and have been working on rooms one at a time. We started the last room in August and my husband kind of just...stopped. LOL. Finally I had to get mad and we had to have a serious talk about realistic timelines haha. Things are moving again now! Your renovations look great! Planning is a key aspect of a successful home improvement project, along with budgeting and thinking of the value of the improvements in the future. For example, energy saving updates can add up to savings for years to come, which makes the most of your investment. With the downturn in the housing market, homebuyers are finding gazebo plans a great way to improve and upgrade their homes without a painful move. A few years ago, it wasn't uncommon to upgrade by simply buying a bigger and better home. Great place, extraordinary service. If you are remodeling your Commercial Redesigning region, this is when to select certain. Indigo Construction team will help you away regardless of Request A Free Canby Drywall Estimate! The astonishing location has been the lead at work and it was very educated, timely as well as expert. Recommend this for your Commercial Remodeling requirements! Best blog!! Doris install Hydrotherapy Walk-In Shower can easily fit in just your current shower or bath using the conveniences you appear forward to every day including movable hand-held magic wand, simple to-use regulates, the fast on/off bath magic wand capture, and an appealing shower hang framework in order to decreases spills.